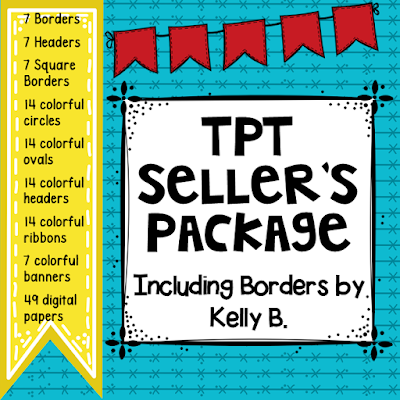 If you follow my TpT store, you know that I love creating borders. I find it relaxing and somewhat therapeutic to draw and design new borders and frames. After a long day at school, it is nice to sit down, relax, and create new designs. It was just a fluke that I even began creating borders, and to be truthful, I never, ever believed that anyone would buy them. After uploading my first set, I thought, "I'll give these a couple of days, and if no one purchases these, I'll simply delete them." To my amazement, that first set still sells almost daily, and the response to my borders has been phenomenal. My latest creation contains not only borders, but colorful and coordinating digital papers inspired from my most popular borders, and as a gift to you, I have just uploaded a freebie to my store containing a small sample from this package. Three digital papers along with one square frame are included in this free sample. Just click the image below to go to my TpT store and download this for free! If you like this sample, check out the entire TpT Seller's Package at my store. and borders. All of these things are available at a great price! This seller's bundle is a great set for creating product covers, classroom activities, and more! There are many possibilities when you combine this package along with your creativity! Don't forget to download the freebie! Enjoy, and have a blessed day! Teaching theme in fourth grade is not easy, but it is very rewarding to see the students' little light bulbs come on! 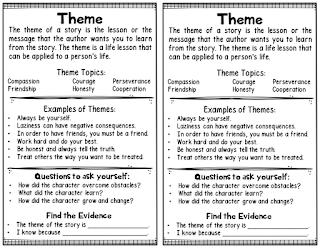 In my experience, students need many opportunities to find theme in stories, and I love giving my students a variety of ways to do this. I am not a Madonna fan, but I do love this book by her and the message in this story. The theme of, "You should not spread rumors about others" or " Once a rumor is spread, you can never take back those words" are themes that most students can easily recognize in this book. I highly recommend this book if you can locate a copy. Unfortunately, I think this book is now out of print, but you may be able to locate a used copy. I stumbled upon this book several years ago at our local used book store and have never regretted the purchase. I use it every year for multiple skills and strategies. Although the reading level of this book is lower, the theme in this sweet story about a special friendship may be slightly more challenging for some of your students to express, but it is worth the challenge. Students will enjoy this story as well as the theme of, "Friendships can span generations." This is a fun story with colorful illustrations. Your students will quickly recognize the theme of "Always be yourself" in this humorous story. This is a great choice for those struggling with theme. Finally, any of Patricia Polacco books are wonderful choices when teaching theme. 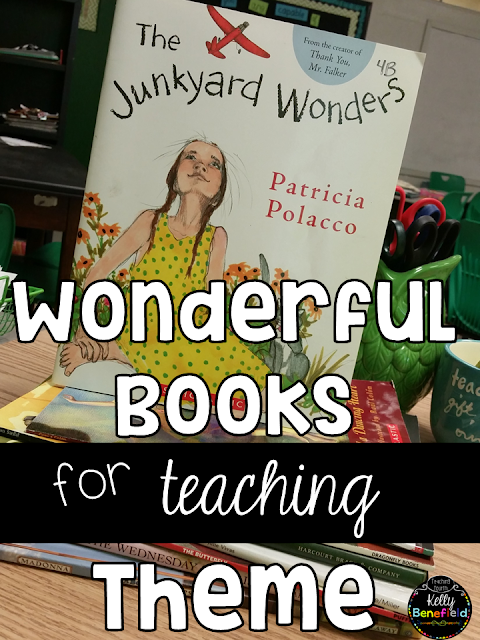 The Junkyard Wonders was my choice this year to use with my students while teaching theme. Most students can easily recognize the theme of "Never give up" in this beautifully told story. After reading aloud Sister Anne's Hands, the students and I worked together to chart the character's words and actions, our inference, and the author's message of the story. This modeling activity helped my students tremendously in understanding and finding theme. This year, I actually began teaching theme by reading this book aloud to the class as a model text. We discussed and "turned and talked" throughout the story. we then worked together to create the anchor chart. Finally, I paired up the students and gave each pair the books that I listed above (in #1). After partner reading the picture books, students worked together to create charts in their journals similar to the chart above. I have also included a link to a free journal reference page for theme. Simply print the page, cut it in half, and give one-half to each student to use as a reference when searching for, writing about, or discussing theme with groups or a partner. This freebie will make a great reference for your students. My students loved the next activity that we used to review theme. I played the theme song to "Fuller House," and my students worked together to determine the theme of the song. (Families are always there for you. Families will stick together. etc.) This was a fun, quick activity to open up a review lesson on theme. It definitely caught my students' attentions, and they loved singing along. The link to the theme song on Youtube is here: Fuller House Theme Song If your students are not familiar with this show or song, you may want to play the longer version with the words Fuller House theme song with words and focus on the chorus of the song. Also, if you are not familiar with SafeShare.TV, this is a great way to show Youtube videos in your classroom to insure only the video and no inappropriate content will be shown. It takes away any advertisements before an video previews at the end. It is a must in your classroom if you are showing Youtube video clips, and it is very quick and easy to use. I have this on my favorites bar so that it is just a click away. If you have followed me for a while now, you probably already know that I love using graphic organizers. After going through extensive training on reading strategies several years ago, I became hooked on graphic organizers, and the results I saw in my classroom convinced me that graphic organizers are an excellent tool that I want to continue to use with my students. For me, there is no question about using graphic organizers when teaching theme. 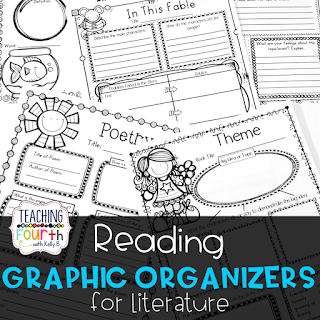 My best selling Common Core: Graphic Organizers for Reading Literature contains 4 graphic organizers perfect for teaching theme, moral, and lessons in stories. They are a fabulous way for students to use with any book or story and to write about their reading. They also make a great assessment tool as well. This packet comes highly recommended. I'd love for you to check out all of the wonderful reviews on this set. 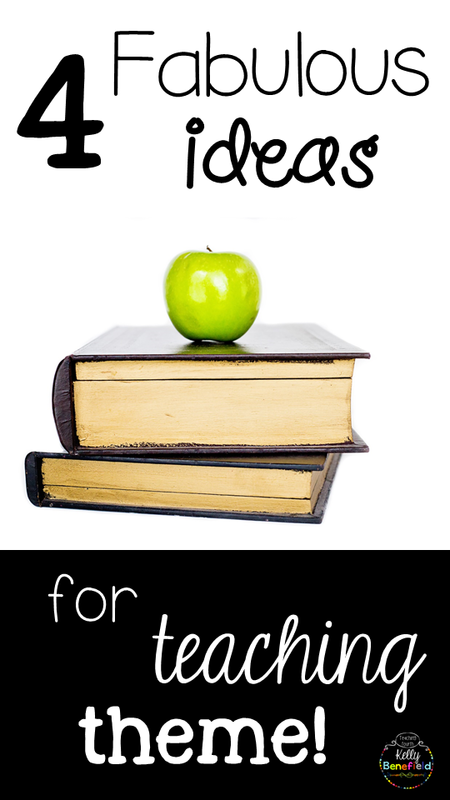 I hope you found these ideas helpful for your own classroom! Thanks so much for dropping by, and have a blessed day! 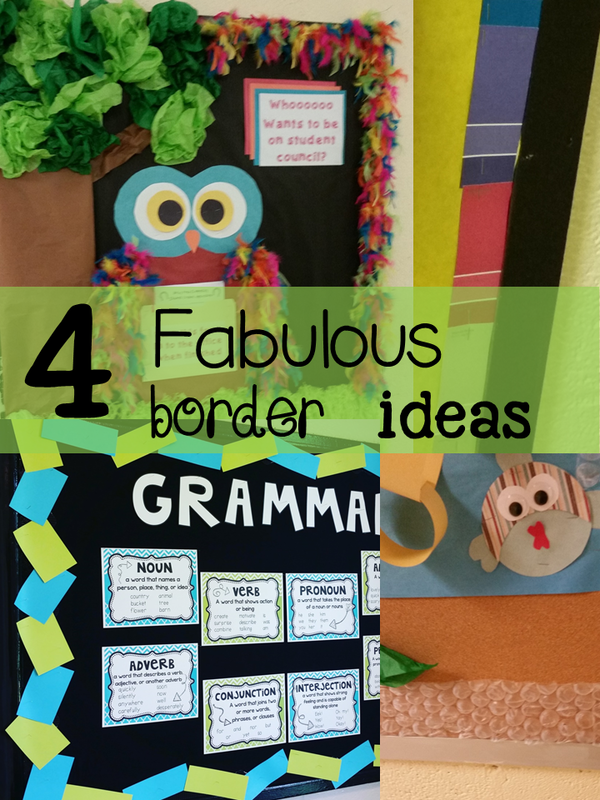 Whether you are looking for inspiration for creative borders to complete your bulletin board or need some unique and interesting ideas, these creative bulletin board border ideas will add a flair to your bulletin board creations! I love bulletin boards! To be truthful, I have always begun planning my bulletin boards for my classroom months before the beginning of school. In fact, when I began teaching (many years ago), it was trendy to change your classroom bulletin boards every month or at least every season. I must say that I am glad that I am a little wiser and now plan my bulletin boards to be functional throughout the entire school year. 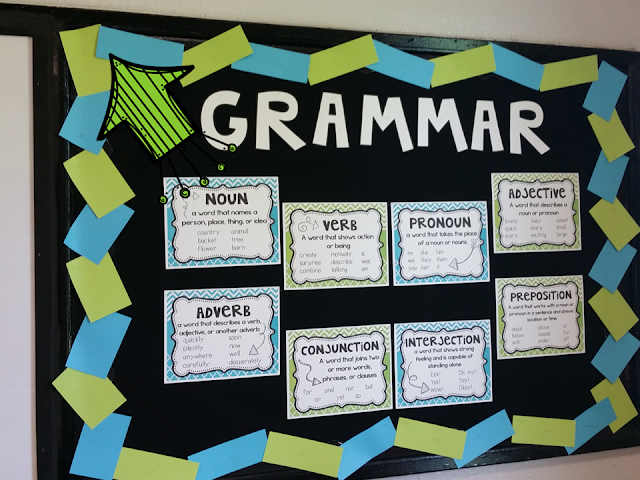 One of my favorite things about bulletin boards today is the creative ideas that teachers have in designing unique bulletin boards, and part of that creativity involves creating unique bulletin board borders. Here are some creative ideas that I found throughout my school this year. I have shared most of these bulletin board with you already, but I wanted to point out the borders on these creative boards. Look closely at this octopus bulletin board made by our school counselor. The entire border is bubble wrap!! 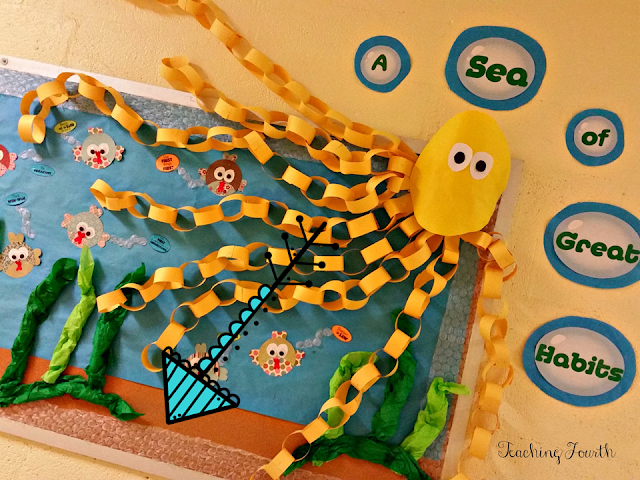 How cute and perfect is that for an under the sea themed bulletin board! Although it is not technically a border, wouldn't chain links be another great idea to use as a border as well! 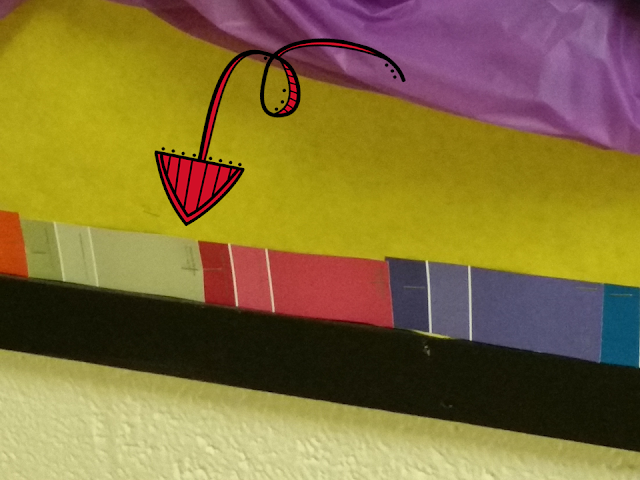 Paint chips cut in half make another bright, colorful, and free bulletin board border. You could use multi-colored chips, as shown here, or choose paint chips in the same shade for a more uniform look. 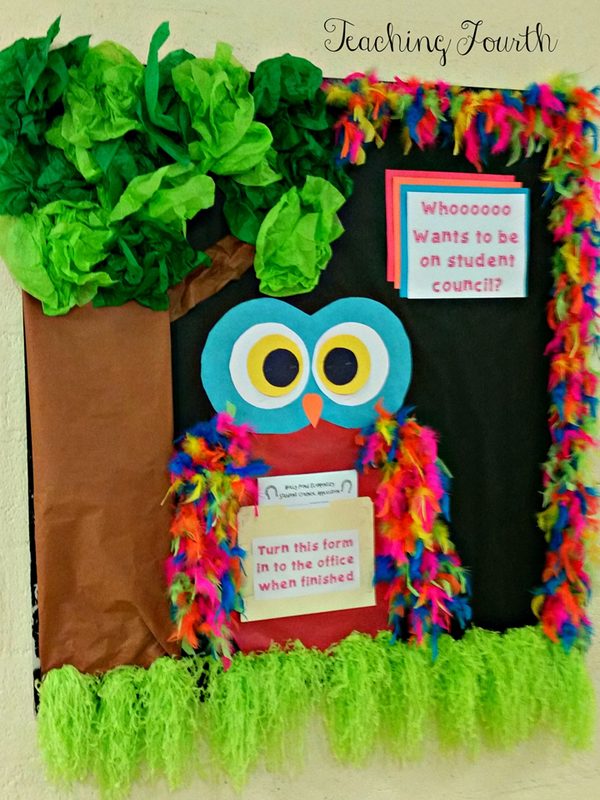 I just love this owl bulletin board, also created by our school counselor, and these borders are some of the most creative I have seen! I just love the feather boa border! It is bright and colorful and adds texture to this amazing board. Also, she lined the bottom of this board with small green pom pom shakers. Too cute! This bulletin board border was a happy accident. When I designed these parts of speech posters, I thought I had green and blue borders at school. After searching, I realized I did not have any borders in either one of those colors. I did not have time to order border and receive it before the beginning of school, and we do not have a teacher store in our town, so I went searching through my closet and found blank index cards in the perfect shade of green and blue. This was the final result, and I think this border is much better than my original plan. Thank you so much for stopping by, and have a blessed day!